Summer is here! Here come the longer days, and getaways with friends and family. 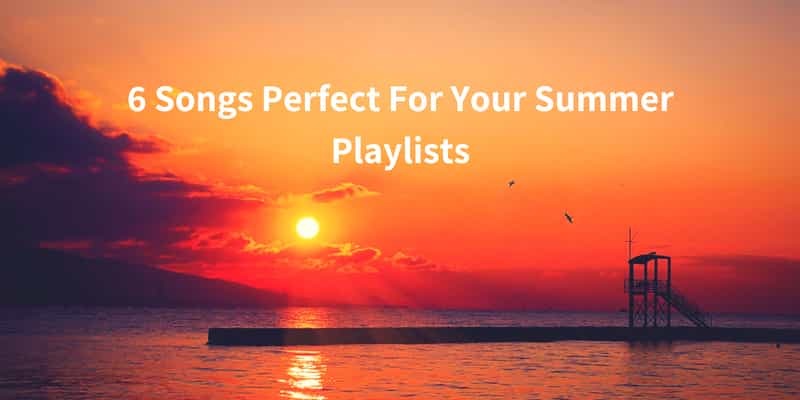 Or, like me, you might well be stuck working all summer, staring longingly at the window to catch a bit of sun…Anyway, the great thing about summer is the playlist the nicer weather inspires us. We want light, sun and energy even in the music we listen to. So here’s a small selection of songs I will definitely include in my summer playlist. Let’s turn the volume up! This song feels like a celebration of all times we have felt uncertain or full of doubts. With its infectiously good arrangements, it will fill you with joy. You will not want this great song to ever end. Let’s have a little dance party now! It has been for a couple of months now my go to song when I feel a bit down. It is a fun song, but, most of all, a really uplifting one. If I made a movie (this will probably never happen, but a girl can dream), this would be the song I would play when my character leaves his hometown, and rolls down the window of his rented car looking at the unknown. Anyway, this track feels like freedom. It is a must for any summer playlist. If you are a fan of Passion Pit, you’ll probably get why I love this song. Some great 80s vibes with this one. Perfect track to dance to in the kitchen while cooking (or trying to cook). This has been my morning song for the last month. It is this kind of music you listen to right before the fireworks display. Who can resist a bit of synth pop? Infectiously good! This song is a burst of hope and positive energy. This is one of the many great tracks by The Unknown Neighbour, aka Berlin based folk singer-songwriter Sascha Zemka. If you like a bit of banjo, you’re going to love this track. Even if you are a bit allergic to it, you should give it a chance anyway. It is so joyful and uplifting that I am sure it can make you appreciate the craziness and boldness this instrument can bring. My little heart enters a joyful and hopeful haze every time I put this song on. And yours will too! No summer playlist without at least one Husky’s song. This track would be one of the first few ones on a road trip mixtape (some people still make those!). The lyrics (‘I am leaving’ repeated a few times) illustrate well what this song inspires me. This is the first jump toward your next adventure. Ok, this song does not get me on my feet dancing. It even makes me a bit emotional (but the good kind of emotional). This track is a huge breath of fresh air. It is an invitation for new adventures, and to be bold. It is romantic, grandiose, and beautiful. This is the song I would play at the top of the mountain (if I ever went mountain climbing).